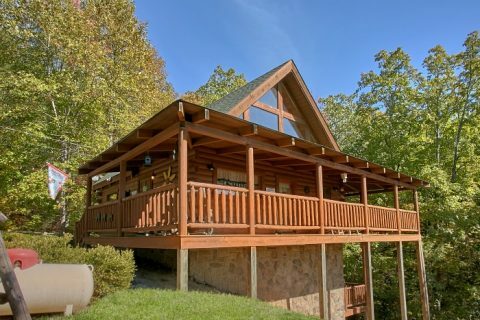 Smoky Mountains Cabin Rental | "BlueBaery Hill"
"BlueBaery Hill" provides the perfect Smoky Mountains cabin rental for your family vacation or getaway in Tennessee. 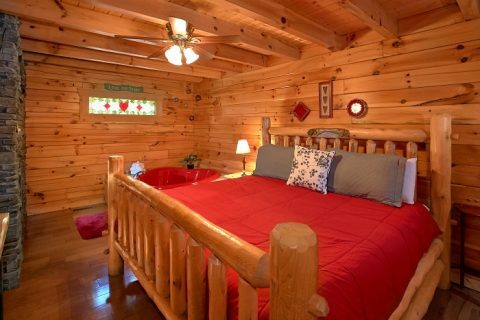 This 3-bedroom cabin, formerly known as "Hearts Desire" places guests minutes from Pigeon Forge and Gatlinburg! 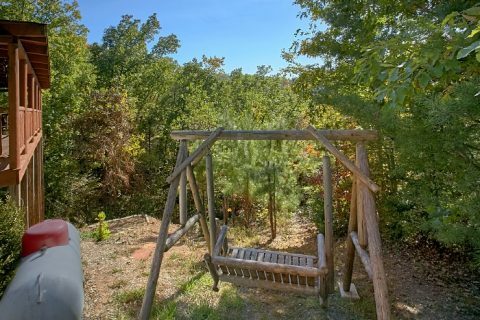 This rental is perfect for anyone who loves the outdoors. 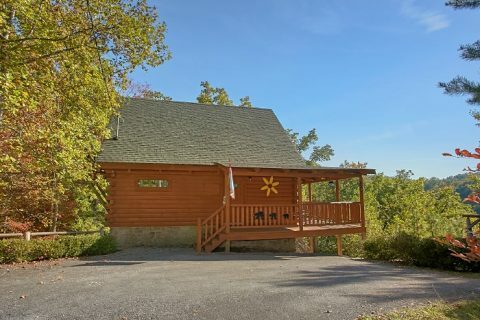 From this cabin's scenic mountain view to a small walking trail can be enjoyed on the property, there are plenty of ways to enjoy nature in the Smokies. 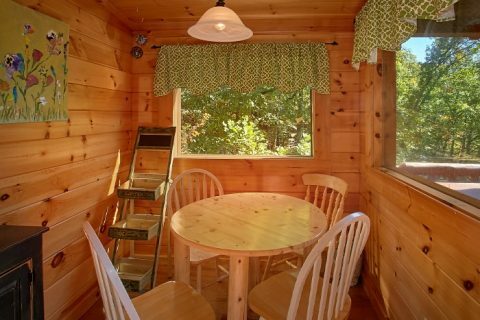 This is a spacious cabin rental sleeps up to 8 guests. 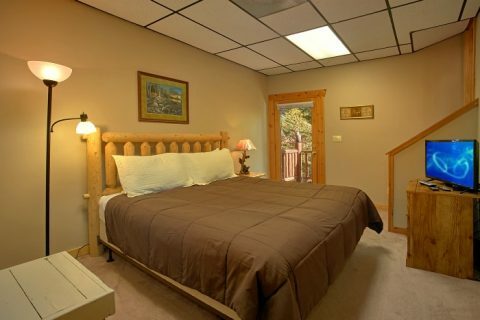 Each of this cabin's 3 bedrooms features a comfortable king-size bed and a private flat-screen television. 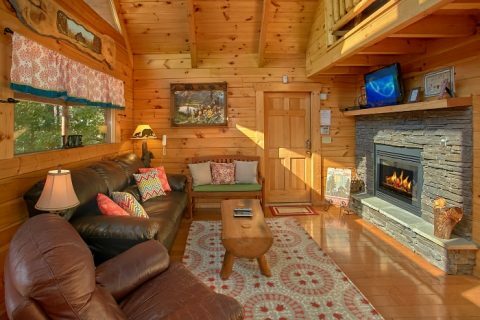 With log furnishings, a stacked stone double-sided gas log fireplace, a quaint dining nook, and charming country accents, this family vacation cabin rental is a cozy place to stay. 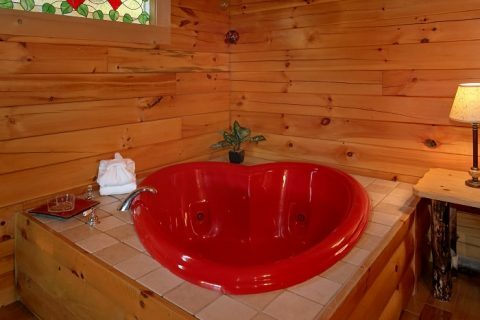 Additionally, your cabin provides a bassinet for infants. 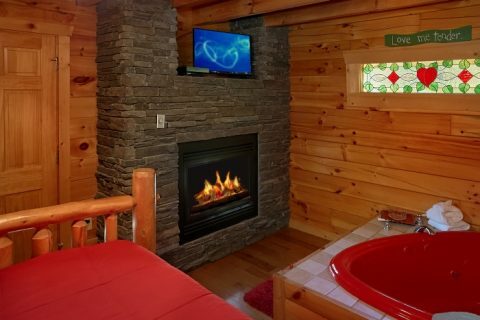 The master suite boasts a heart-shaped jacuzzi for two and beautiful stack stoned fireplace to add ambiance. The double-sided fireplace also provides its warm glow to the cozy living room. 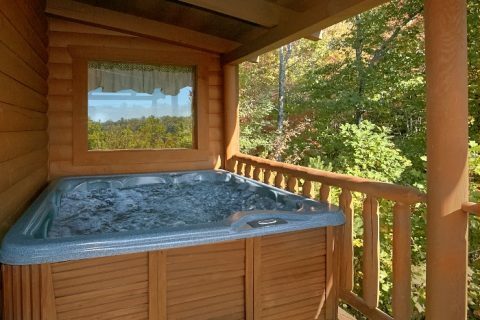 Outside, a large hot tub on the covered deck overlooks mountain views, providing the perfect place to relax. 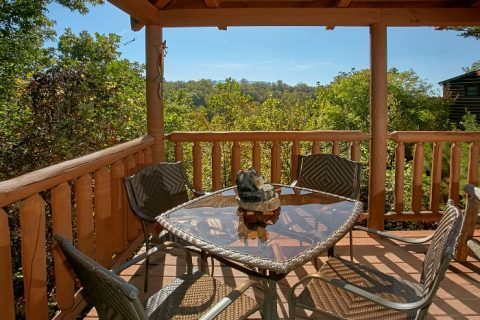 Here, you can enjoy a picnic in the great outdoors or take a relaxing stroll on this property's walking trail. 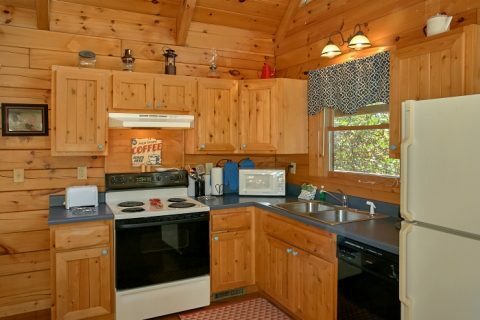 Your cabin rental's fully equipped kitchen and charcoal grill make mealtimes a snap, and, with your cabin's washer and dryer, there's no need to pack as much. Your family cabin vacation is all about family fun! 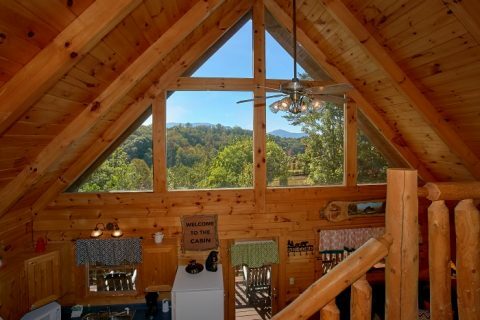 This Smoky Mountains cabin rental rests between Gatlinburg and Pigeon Forge so you can stay close to the sights you want to see. 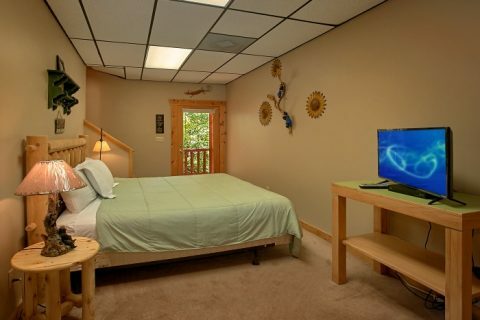 Whether you plan on going to Dollywood, the Great Smoky Mountains National Park, Downtown Pigeon Forge, and Ober Ski Mountain, your Sky Harbor cabin keeps you close to all the action. 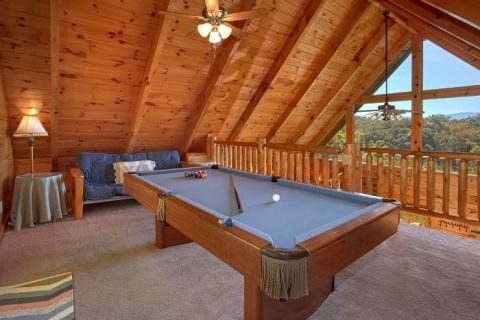 When you return to your family vacation cabin rental after a day of excitement, keep the fun going with games of billiards on the pool table. With this rental's WiFi Internet, you can share photos and stories of your trip with friends and family back home. 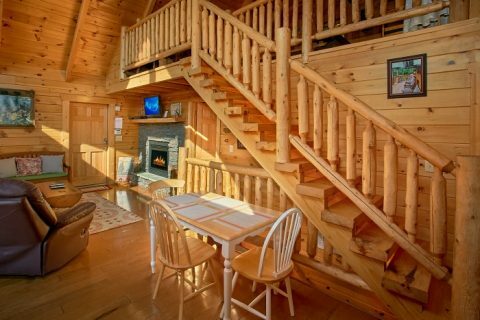 Book your Smoky Mountains cabin rental online with Cabins USA for immediate savings on your family cabin vacation!